This is a copy of an article that I have released in WEEKEND NOTES this week. If you wish to read the original and discover plenty of week end ideas (to do and to share), follow the link. Cut up the sun dried tomatoes. Wash and chop the herbs. Mix all the ingredients in a food processor. Add the sun dried tomatoes towards the end so they don’t get minced up. This recipe will yield about 20 deliciously savoury biscuits, perfect to eat with cheese or as a snack. 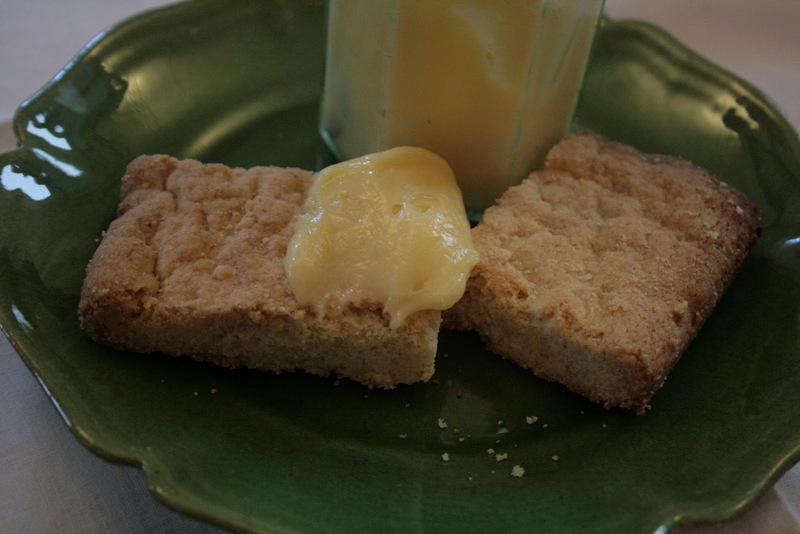 Their texture is that of a shortbread: crumbly and melting at once. Of course the combinations of herbs and flavours are endless and once you have mastered this combination you could try: black olives and thyme, dried fig and tarragon or crushed almond and paprika… I took a basket of these to a party lately and they fitted very nicely on the aperitif buffet. Nutrition notes: I advise to use spelt rather than wheat flour in those shortbreads because spelt gives a nutty, savoury taste to biscuits but also because spelt contains less gluten than normal flour and is easier on your digestive tract. 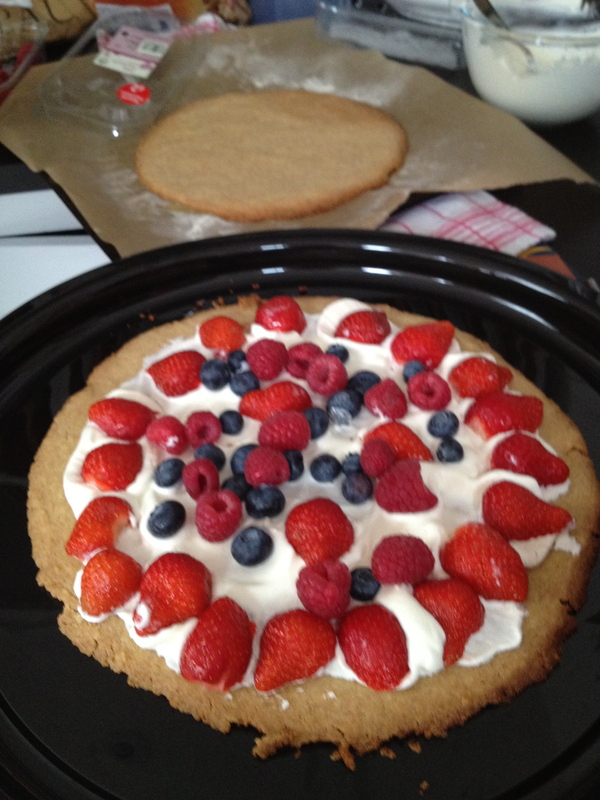 -I like using a mix of Spelt and wheat flour but ordinary cake flour will do too. Slice the vanilla pod in two and scrape the inside on one half with a blunt knife. Mix all the ingredients in a mixer until they form a ball. Roll it and store in a plastic bag in the fridge for ½ hour. Preheat the over to 170. Divide the dough in three equal parts. Using a rolling pin, prepare each circle on a piece of greaseproof paper and cut them out with the help of a template such as a cake tin or a round tin base. They should be roughly of the same thickness and size. 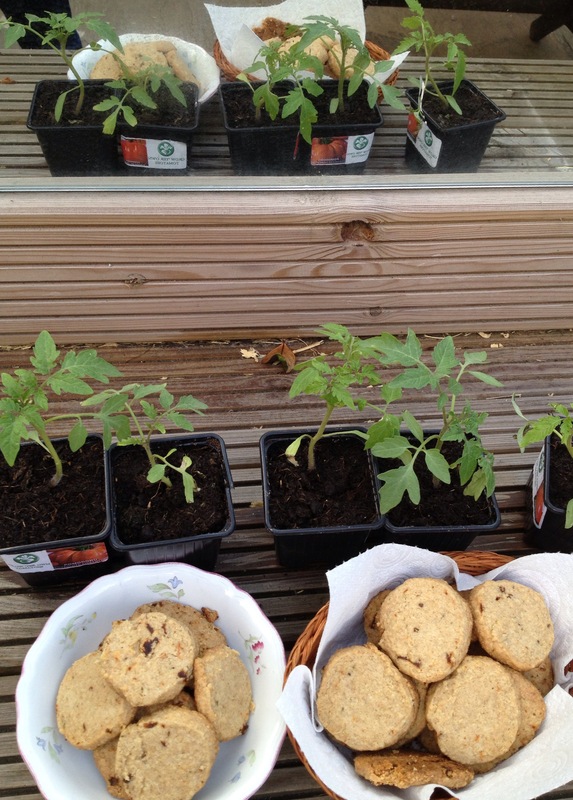 Roll them down to half a centimetre thickness so they hold their shape but are not too heavy when baked. Put each circle on a different rack in the oven, trying to get the racks to fit in the lower half of the oven. I then select the fan or « rotisserie » icon so the air circulates around the rack and they cook evenly. Bake them for about 15 to 20 minutes depending on the thickness. They should hardly colour or only around the edges. If you cook the dough too long, it will be brittle and difficult to work with. The circles are still soft when they come out and will harden as they cool. Reserve on a rack to cool down while your prepare the filling. Whisk the cream with the sugar until it makes soft peaks. Reserve. Rinse and cut the tail off the berries. Cut the strawberries in half. Transfer carefully the first disk onto your chosen stand. Spread some cream over the disk. Not too much so it does not get too soggy ! Make a first row of strawberries on the outside of the circle. Dispose the other berries randomly inside. Do the same process for the second circle. Stuff more strawberries around the sides if you can see gaps. Use up the raspberries for the inside of the cake. 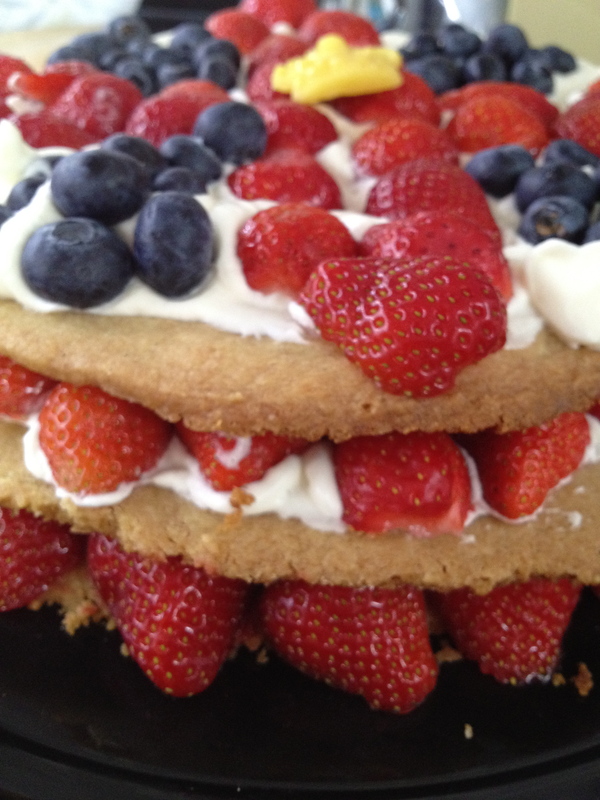 Spread a generous layer of cream and start by making a large central cross with the strawberries, then arrange the blueberries into four corners to suggest the British flag. Decorate with a crown made with marzipan- or not ! For mine, I used a silicone mould and painted the crown with a bit of gold and red food colouring from Kitchen Squires. 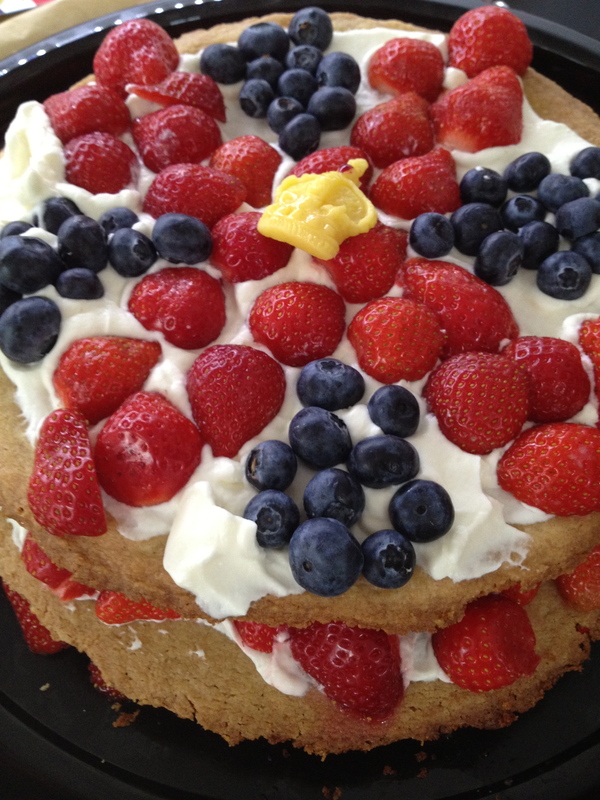 We shared this for a neighbour’s Jubilee street party with a glass of Pimm’s, in a house decked out with more flags than the Britannia ! 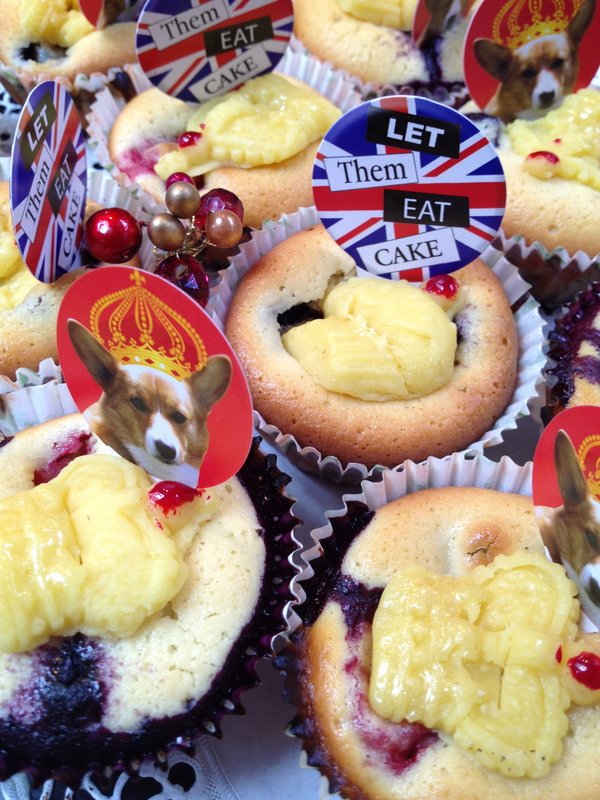 I am French and a republican and but I am all for a party and a cook off if there is one going on : Any excuse will do to bake and share, eat cake and raise a toast. God save THEIR queen. Put everything together in a food processor and mix until the dough makes a ball. Press the dough into a shallow cake tin and bake in the Aga or very hot oven (220°) for 20 min – or until the edges are golden. Take out and make incisions in the hot dough so the cutting will be easier once it has cooled down. 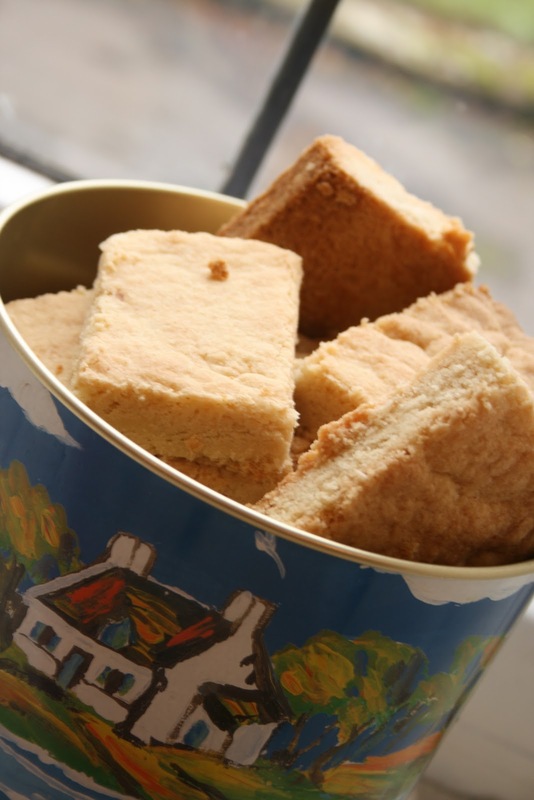 These traditional scottish biscuits will keep for a few days in a tin and they are delicious with a cold glass of milk or a warming cup of tea. For a personal twist, I had a few drops of bitter almond essence or orange peel into the mix.